… Will We Ever Leave? That was the welcome we received when we arrived at our guest house on Caye Caulker Island in Belize. The sun had set and the cool evening breeze gently swept over the island, rustling the palm trees above us. After our late arrival to the island and dealing with our immigration issues, it was nice to receive this laid-back introduction. We placed our bags in our colourful room and lazily wandered down the sandy lanes to find somewhere to eat. A row of funky beach bars playing Caribbean reggae music lined the entire western end of the island. Men were tending to smoking grills right on the beach, with the surrounding picnic tables holding groups of loudly chatting tourists and Belizeans enjoying freshly grilled chicken. Our movement slowed to the beat of the Rastafarian melodies that echoed across the powdery sands and we soon realized that this was yet another paradise that we were going to enjoy. 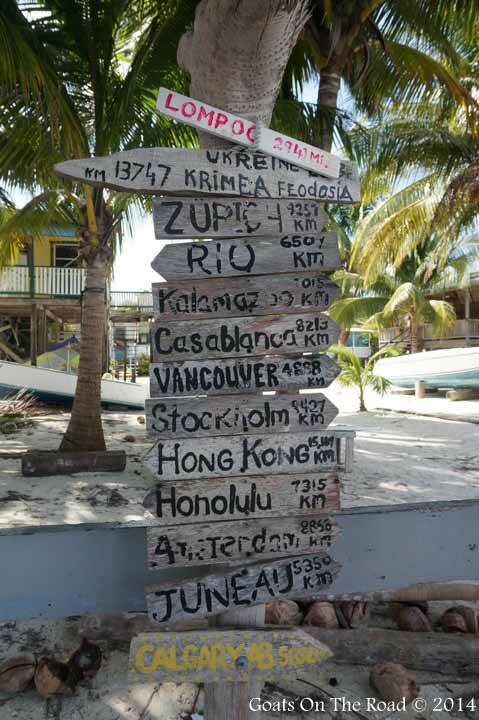 Caye Caulker is a small, coral island off the eastern coast of Belize, about 32 km north of Belize City. Just 8 km long by 1.6 km wide, this tiny atoll has been severed in two by what is commonly referred to as “the split“. Some people claim that the split was created by Hurricane Hattie in 1961, but we soon found out that this story is false. In truth, according to island’s inhabitants who helped to dig the trench, the hurricane only created a small creek, just a few inches deep. The Village Council Chairman at the time, Ramon Reyes, ordered a waterway to be dredged deeper to create a practical passage from the eastern shores to the west. The new channel would allow for dugout canoes to pass through without having to circumnavigate the entire island. Today the split is nearly 7 meters deep and it is growing rapidly from natural current erosion. 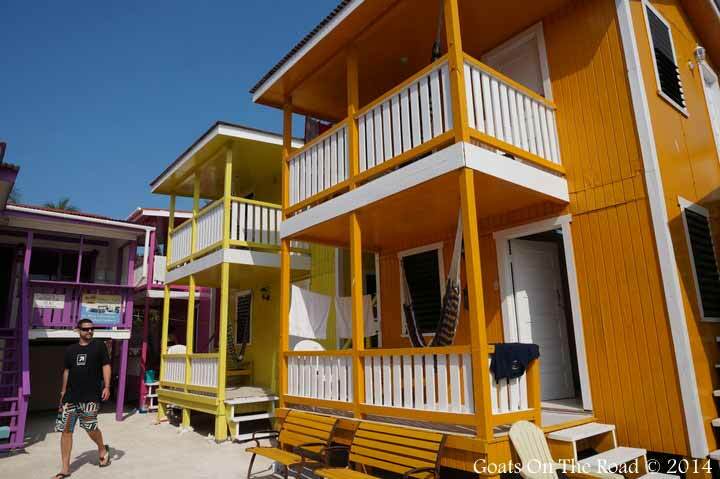 Although the growing gash threatens Caye Caulker’s future, for now it makes for a very funky place to hang out. With a loud beach bar perched at the edge of the watery avenue, the split is the best place to swim on the island. We spent much of our time there, ordering ice-cold buckets of beer and lazing in the sun while listening to a mix of western and eastern Caribbean tunes. On one particular day at the split, we spotted a man flying about 4 meters above the water. Streams of jet powered water shot from his feet and he looked like a shirtless iron man in board shorts. We rushed over to get a better view and joined a crowd of cheering partiers near the bar. He was riding on what we now know is called a “fly board”. He put on a show, twisting, diving and flipping on this incredible piece of technology. The entire beach was cheering him on and I think all of us were amazed at what we were seeing. The man on the “fly board” was an exception to an otherwise calm and quiet atmosphere on the island. 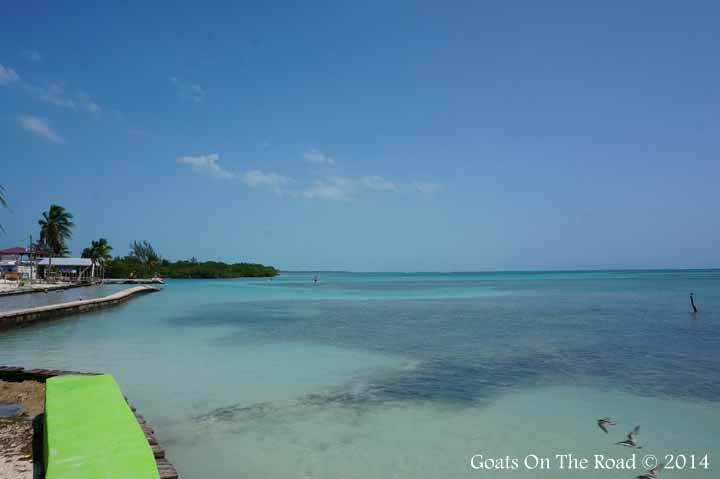 Caye Caulker’s slow, tranquilized ambience often reminded us of Isla Holbox in Mexico. In fact, the motto on the island is “Go Slow”. Every hour was spent lazing by the water, strolling the dusty lanes, listening to music and just enjoying the funky, laid-back, Caribbean vibe. You Don’t Often See Vancouver & Calgary On These Signs! We made plans to meet up with our new friends Celia and Jonas of the Nomadic Danes one evening. We swapped travel stories and blogging tips over dinner and drinks and really enjoyed each other’s company. It’s always fun to meet up with fellow bloggers and Celia and Jonas taught us a lot about online business. It was great to meet up with like-minded people and we hope to keep in touch and travel together again in the future. At the end of each day spent on Caye Caulker, just as the sun started to rest on the sea, bottles of beer would magically start to appear in everyone’s hand. It would be hard to spot someone, foreign or local, without an ice-cold Belikin beer in tow. It was this perpetual holiday feel that made Caye Caulker a hard place to leave. We spent 8 days there and enjoyed it so much that we eventually returned after a trip to nearby Ambergris Caye, where we were invited to stay at the beautiful Victoria House Resort. Is it me or isn't that aerial shot of some "other" split? You're right, the picture in the article is St. George's Caye.